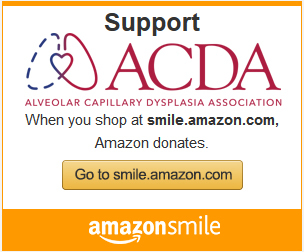 The ACDA tries to provide as much help and support as possible to families who have suffered the pain of losing a child to ACDMPV. Parents are invited to join the closed “ACD Parent Group” on Facebook. This is a private group for parents who have lost a child to ACDMPV or whose child has been diagnosed with ACDMPV. In order to protect the privacy of the parents in the group, you will be asked to confirm this criteria is met when you ask to join. Note: The views and opinions of authors expressed in this group do not necessarily state or reflect those of the ACDA as it is a support group separately maintained by affected parents and not the ACDA. Contact Emily Eschweiler for more information by searching for Emily John Eschweiler on Facebook. Family members of those who have lost a child to ACDMPV are invited to join the closed “Alveolar Capillary Dysplasia Family Group” on Facebook. Extended family (grandparents, siblings, aunts, uncles, godparents, etc.) are welcome to join this group. Note: The views and opinions of authors expressed in this group do not necessarily state or reflect those of the ACDA as it is a support group separately maintained by affected families and not the ACDA. Contact Emily Eschweiler for more information by searching for Emily John Eschweiler on Facebook. Contact us by using the information in the menu button. Please send an email and/or REGISTER with the ACDA. There are many other organizations who offer complementary support services. Below is a list of links to support organizations that you may find helpful.